Address: 6006 Midnight Pass Rd. 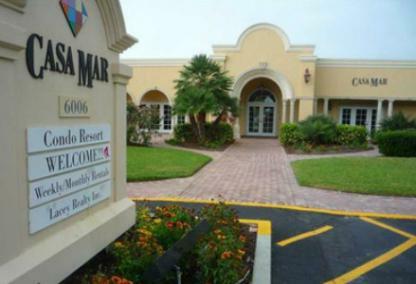 Casa Mar Condominium on Siesta Key is an award-winning community located just off the coast of Sarasota. Awarded "Best of the Best" by Sarasota Magazine for the last four consecutive years, this lovely getaway on the key is a top choice among investors, condo buyers, and vacationers alike. The prime location and one-week minimum rental policy, only adds to the appeal. With Siesta Key drawing an average of 18,000 visitors to the area each season, the rental potential is quite attractive. Situated directly on "The #1 Beach in the U.S.A.," according to expert Dr. Beach, Casa Mar occupies over eight-hundred feet of prime beachfront. Crescent Beach is an exclusive area just south of Siesta Key Public Beach, and home to Point of Rocks, one of the most highly regarded places to snorkel. Built in 1960, Casa Mar has a total of 74 villas with a variety of configuration options. With studio, one, two, and three-bedroom floor plans, the average villa is 1,008 square feet in size. The villas, separated into two rows, all face a beautiful palm-lined courtyard in the center or the property. Residents and guests enjoy access to two pools, clubhouse, community room, lighted shuffleboard, tennis courts, barbeque areas,video library, and an internet café. The meticulously kept courtyard leads right to the beach where residents and guests enjoy their own private piece of paradise. Additionally, each villa comes with its own designated covered parking space. While many prefer the tranquil environment of Casa Mar, those interested in a more active day in the sun are sure to find it at the Public Beach, only minutes north of the property. Siesta Key Beach is one of the top ten beaches in the world. The public beach is full of amenities, such as a shaded playground, picnic areas, a pavilion, concession areas, volleyball, basketball, tennis, and "Old Florida" style nature trails. Another favorite activity on this beloved beach is the Sunday evening drum circle, drawing hundreds of percussionists and spectators to partake in a sunset celebration each week. Just north of the public beach, is the Siesta Key Village, a commercial district with a diverse selection of boutiques, restaurants, and entertainment. Complimentary taxis run along the main road inviting residents to enjoy a fun night in the village. Also, close by is the Crescent Village Shopping Center complete with a post office and grocery. Those interested in exploring the mainland may do so at ease, via the South Stickney Point Bridge. Downtown Sarasota, St Armand's Circle and Longboat Key are all easily accessible and within less than a twenty-minute drive from the property.